Beverly Hills, CA (The Hollywood Times) 9/7/2018 –Is there anything David Spade can’t do? The answer is no. He is the most talented Comedic Actor of our time. Well, that is my opinion and this is not only a review of the film Warning Shot but maybe a fan letter to David Spade. Ahhhhh… The joys of being a colloquial writer. In this new film David Spade plays the nervous, greedy role of Bobby and does it so with ease you would think he has been doing dramatic roles all of his life. Not the case.. as this is his first. He nails it! The WGA :Writers Guild Awards Theatre hosted the Premiere of Warning Shot with much fanfare for this new film directed by Dustin Fairbanks in which Audrey (Tammy Blanchard), a single mother to daughter, Cheyenne (Onata Aprile), is trapped in a constant struggle to make ends meet with an eviction notice on their door in one of the opening scenes. When her grandfather passes away, she inherits the family’s farmhouse, for which the lucrative water rights are coveted by Calvin (Bruce Dern) a longtime business rival of Audrey’s grandfather. Calvin’s own grandson, Bobby (David Spade), is on a mission to prove that he can take on the family business, and decides to take matters into his own hands by hiring the mentally unstable Rainy (Guillermo Diaz) and drug-addicted Jawari (Dwight Henry) to intimidate Audrey and Cheyenne into giving up the property. Once Bobby’s goons realize Audrey does not intend to go quietly, the situation quickly spirals out of control. In this 86 minutes high stake thriller.. we witness the strength of a mother doing everything within her power to protect her young daughter. You will be on the edge of your seat the entire time. I was clutching my popcorn in some scenes. However I must admit that I am a wimp when it comes to violence. 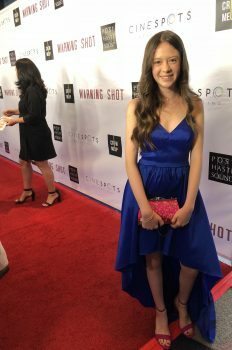 I spoke with several of the actors and producers on the red carpet. 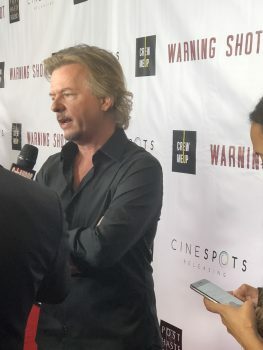 David Spade always lights up the room and we spoke quickly about the fact that this was a serious role for him and he agreed that this was a film that he couldn’t pass up. Spero Stamoulis, who was one of the Producers, said that the film was about female empowerment and I must agree. Also he said that the most important thing in being a producer is to be grounded and I have always prided myself in being real. There is a hollywood stigma of being pretentious but the most important thing is to be personable and humble and that is what It makes your work incredibly beautiful . Anytime you do an independent film it takes so much strength and so much courage. All in all it was a great event and I applaud the cast and crew!! 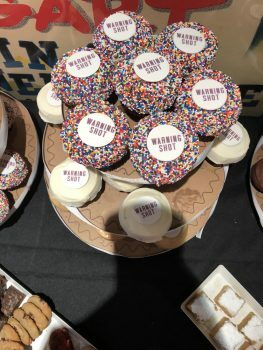 Warning Shot opens in wide release on September 14th 2018.